K3T Black Beauties coated electric guitar strings on hexagonal core. 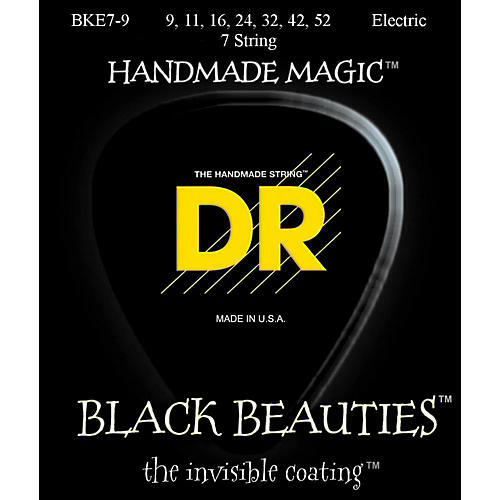 DRs EXTRA-Life Black Beauties offer guitar players a superior black coated string without sacrificing the crisp tone, clarity, and volume of traditional DR HandMade Strings. EXTRA-Life is a super thin advanced .0003" coating on the plain electric guitar strings and on the wrap wire for added protection. DR's remarkable, and proprietary, patent pending K3T Technology Coating is the first coating that makes no apologies and no excuses. Players say these strings have less unwanted overtones, more volume, great clarity and articulation than standard uncoated strings. Yet, they provide the same protection against corrosion due to humidity and perspiration as well as the increased tonal life coated strings have come to be known for. Get extra life and improved playability from these black beauties. Order today.